Ecology: Common and widespread native grass. One of the first plants to start growth in early spring. Adapted to wide variety of soils. Inhabits thinner, drier soils than bluebunch wheatgrass, often growing on lithosols. Relatively short lived. 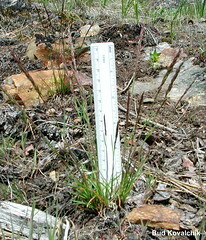 Leaves wither and go dormant in dry conditions. Because it is shallow-rooted, it must complete growth and seed production early before available soil moisture has been depleted.